Analysis: The transaction officially rules Nugent out for the next eight weeks, leaving Matt McCrane to handle the kicking job Sunday against Cleveland. The Raiders may eventually look at other options if McCrane struggles, which is a distinct possibility given that he has never kicked in a regular-season game. Analysis: Nugent apparently sustained the injury during Sunday's 28-20 loss to the Dolphins. While Nugent hasn't officially been ruled out for the Week 4 matchup with the Browns, the Raiders' decision to sign McCrane likely signals the veteran will miss a game or more. Analysis: Nugent was perfect from 25 and 52 yards in Week 3, adding the 50-plus yarder with less than a minute left in the contest to make it a one-score game late. The 36-year-old has yet to miss a field-goal attempt in six tries this season as he looks to maintain his momentum against the Browns in Week 4. Analysis: Nugent also had an extra-point attempt blocked following Marshawn Lynch's one-yard touchdown run in the second quarter, which ultimately proved costly as the Raiders lost by one. Nugent is perfect on four field-goal attempts through the first two weeks of the season, totaling 14 points and two makes from 40-plus. Analysis: Nugent's Raiders debut saw him knock in field goals from 24 and 48 yards during the second quarter. Although Oakland's offensive struggles meant he wasn't called upon during the second half, this weekend's matchup in Denver should at least present favorable kicking conditions. Nugent is locked in as Oakland's kicker after Eddy Pineiro (groin) was placed on injured reserve over the weekend, Matt Schneidman of The San Jose Mercury News reports. Analysis: Pineiro was placed on IR before roster cuts, officially ruling him out for the entire season. 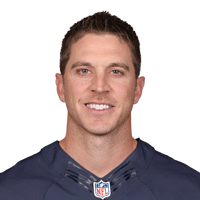 The 36-year-old Nugent offers a wealth of experience, but he's never had the strongest leg and owns an underwhelming 81-percent career conversion rate on field goals. Nugent will make for a low-end fantasy option in Week 1 with the Raiders offense facing a tough Rams defense. Nugent converted his only field-goal attempt during Thursday's preseason finale against the Seahawks. Analysis: With Eddy Pineiro (groin) sidelined, Nugent took care of the Raiders' only field-goal attempt of the game and made it count, booting a 51-yarder through the goal posts early in the second quarter. Given how Pineiro hasn't practiced in over two weeks, at this stage it seems likely that Nugent opens Week 1 as Oakland's starting kicker. Coach Jon Gruden indicated it is "very possible" Nugent could start the season as the Raiders' starting kicker, Michael Gehlken of the Las Vegas Review-Journal reports. Analysis: Nugents' competition, Eddy Pineiro, has been sidelined for about two weeks with a groin injury. Pineiro figures to still have the upper hand in the job battle, as he is a rookie with more long term potential. However, Nugent may have to start the season as the team's kicker should Pineiro's health not be up to par. Nugent knocked down his only field-goal attempt -- from 55 yards -- in the Week 17 loss to the Vikings to finish the season making 11 of 13 field goals in eight games between the Cowboys and Bears. Analysis: Nugent's 84.6 percent success rate was his best since 2011, and he's hovered between 79 and 83 percent for the majority of his 11-year career. The unrestricted free agent will likely have a chance to compete for a starting job with a team during training camp, with his fantasy value largely connected to his landing spot. 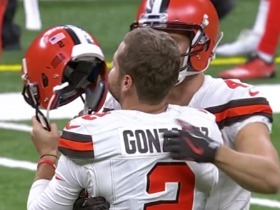 Nugent did not attempt a field goal but missed one of his three extra-point tries in Sunday's 20-3 win over the Browns. Analysis: Nugent has scored 15 points in three appearances since joining the Bears. Including his four games with the Cowboys earlier this season, he's missed just four of 28 total attempts. Nugent converted a field goal and extra point in Saturday's loss to the Lions. Analysis: Nugent was good from 41 yards out on his only field-goal attempt of the contest, but he ended with a disappointing four-point fantasy performance. Although he scored nine points in his debut with the team last week, playing for an inconsistent offense makes him a shaky fantasy option. Nugent converted both of his field-goal attempts while connecting on three of four extra-point attempts in Sunday's victory over the Bengals. 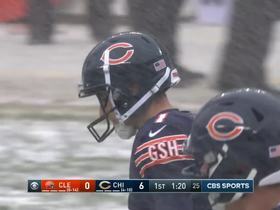 Analysis: Nugent took advantage of one of Chicago's best offensive performances of the season as he posted the second-best fantasy performance by a Bears kicker this season. He could be a sneaky fantasy option, as Chicago kickers have been provided with multiple field goal opportunities in five of their last six games. The Bears plan to sign Nugent to replace Cairo Santos, who re-injured his groin during Sunday's 15-14 loss to the 49ers, Brad Biggs of the Chicago Tribune reports. Analysis: Nugent previously filled in for the Cowboys' Dan Bailey, who also dealt with a groin injury but returned for Week 13. Given the state of Chicago's offense, Nugent will be among the least attractive options at his position. It doesn't help that he's never been good from distance, connecting on just 11 of 28 field-goal attempts from beyond 50 yards in his career. Nugent was officially released by the Cowboys on Monday, according to ESPN.com. Analysis: With Dan Bailey (groin) healthy again, there's no place for Nugent on the Cowboys' roster. The 35-year-old will finish his four-game tenure in Dallas having made seven of nine field-goal attempts and all eight of his PATs. The Cowboys are slated to release Nugent in the near future, David Moore of The Dallas Morning News reports. Analysis: Although Dan Bailey didn't attempt an extra point or field goal in his return Thursday, the Cowboys are confident he's past the groin injury that forced four DNPs in a row. As a result, the team doesn't have a need for a second kicker and will cut Nugent loose. Nugent (coach's decision) is listed as inactive Thursday against the Chargers, David Helman of the Cowboys' official site reports. Analysis: Nugent is yielding kicking duties to Dan Bailey, who has overcome a groin injury to end a four-game stretch of DNPs. Assuming Bailey doesn't falter or suffer another ailment, Nugent is a candidate to be released in the coming days. With Dan Bailey (groin), who is listed as questionable for Thursday's game against the Chargers, anticipating playing in the contest, Nugent may not handle placekicking duties for the Cowboys in Week 12, Brandon George of The Dallas Morning News reports. Nugent converted all three of his field-goal attempts in Sunday's 37-9 loss to the Eagles. 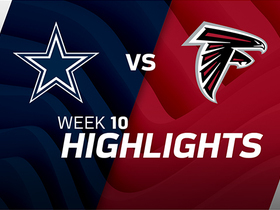 Analysis: Nugent accounted for the entirety of Dallas' points, bringing his tally to 29 points in four appearances while Dan Bailey (groin) has been sidelined. With Bailey returning as a limited practice participant Monday, Nugent's fantasy stock for Thursday's game versus the Chargers will depend on whether the Cowboys' usual kicker is able to be cleared in time for kickoff. Nugent missed his lone field-goal attempt and made his only extra-point try en route to one point in Sunday's 27-7 loss to the Falcons. Analysis: Nugent hit the right upright with a 38-yard attempt during the third quarter. With the Cowboys offense unable to move the ball much, he was provided just one other scoring opportunity. His fantasy stock in Week 11 will depend on whether Dan Bailey (groin) can return from injury. Nugent did not attempt a field goal but did make all four of his extra-point tries in Sunday's 28-17 win over the Chiefs. Analysis: Nugent did all that was required of him Sunday, but his performance was a far cry from his 15 points during his Cowboys debut. Considering Nugent is a stand-in for Dan Bailey (groin), however, he should be happy with his production thus far. 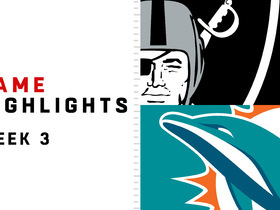 Watch as the Oakland Raiders take on the Miami Dolphins in Week 3. 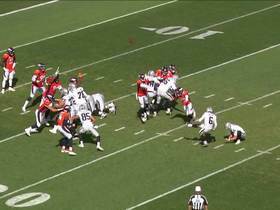 Denver Broncos outside linebacker Shaquil Barrett blocks Oakland Raiders' extra point attempt. 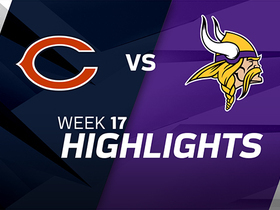 Check out the highlights of the Week 17 matchup between the Chicago Bears and Minnesota Vikings. 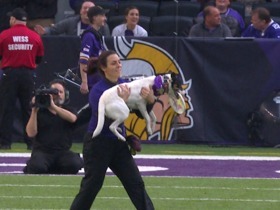 Frisbee dogs entertain during Bears vs. Vikings halftime. Cleveland Browns defensive end Carl Nassib blocks the extra point kick attempt. 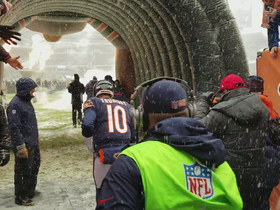 The Chicago Bears get pumped up before their snow game in Week 16 against the Cleveland Browns. 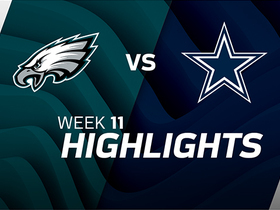 The Philadelphia Eagles take on the Dallas Cowboys in Week 11 of NFL action. 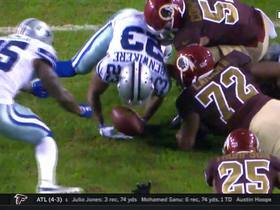 Dallas Cowboys cornerback Bene' Benwikere recovers Washington Redskins running back Chris Thompson fumble.